When Eurpean settlers first penetrated the tall, lush mountain ash forests of Victoria, they were amazed to find exceedingly tall eucalypts with very straight trunks; some of them branchless for up to 60m or more. Early splitters told stories about trees that exceeded 400 feet, (121m) in height. Whether or not such trees actually existed we will never really know. Perhaps the most reliable story of a tall tree is that of the Cornthwaite Tree. 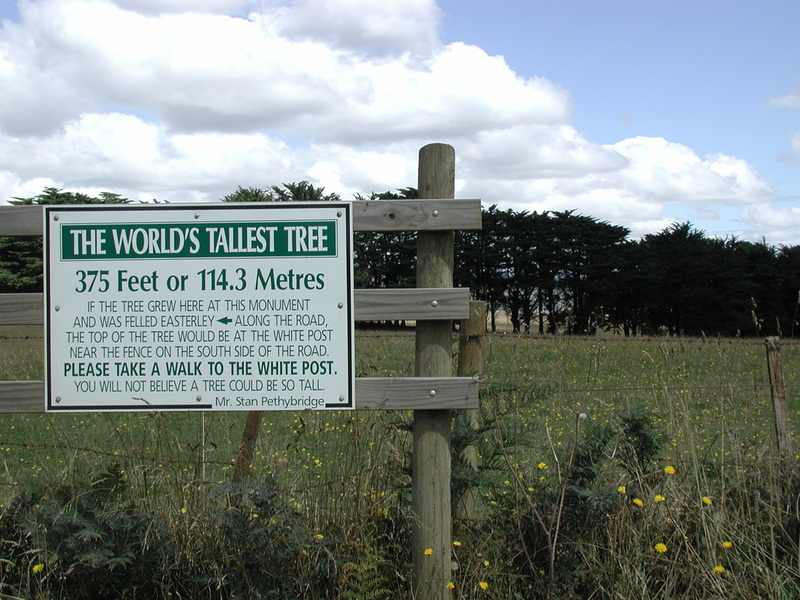 It was cut down near the town of Thorpdale in the Strzelecki ranges in the 1880s and was measured on the ground at 114m tall. One hundred and thirty years later, there is a still a sign at the site in what is now cleared dairy country! Fire is the main regenerating agent of mountain ash forests. When a big fire strikes it usually kills all the current generation of trees, however, the heat of the fire dries the seed capsules in the tree crown and within a few days, millions of seeds fall to the forest floor and start the next generation of forest. Interestingly, without catastrophic fire, these trees will reach 450-550 years of age, collapse and die without a new generation taking their place. A major fire in 1939 burnt over 80% of the existing mountain ash area in the central highlands. As a consequence most of the forest is now just over 70 years old and still growing vigorously. A further fire in 2009, known as 'Black Saturday' killed 173 people. It also killed most of Victoria's last stands of mature mountain ash forests - including the 5 known trees over 90m, which were the tallest trees on the mainland. 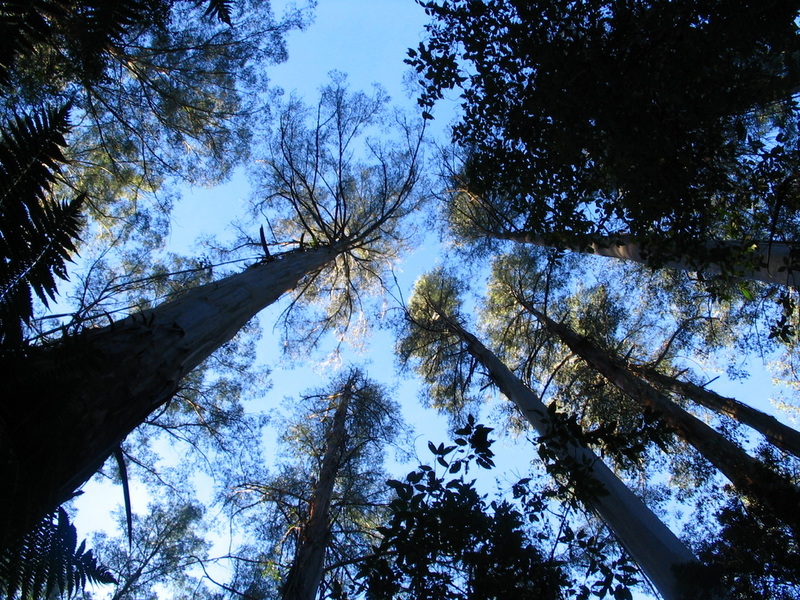 The tallest trees on mainland Australia were all mountain ash trees in the Water catchments of Wallaby Creek and O'Shannassy (see photo below). While these trees were over 300 years old, many of them still had living crowns and studies showed that they were still growing around 5-10cm per year. 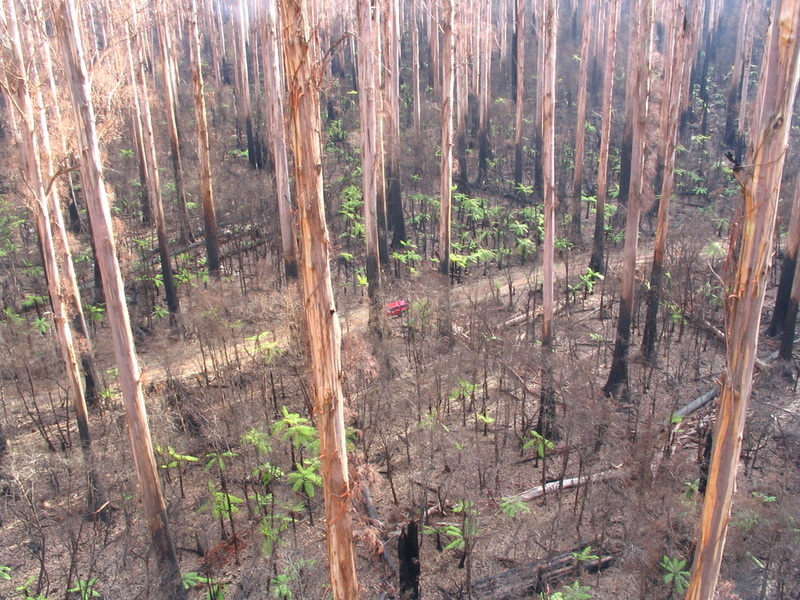 Following the Black Saturday bushfires in 2009, these places are now a sea of 5-10m tall regrowth growing under towering grey dead trunks 70 to 85m tall. Looking up the trunk of 'Big Ash One', branchless for 60m, to its rather small crown. 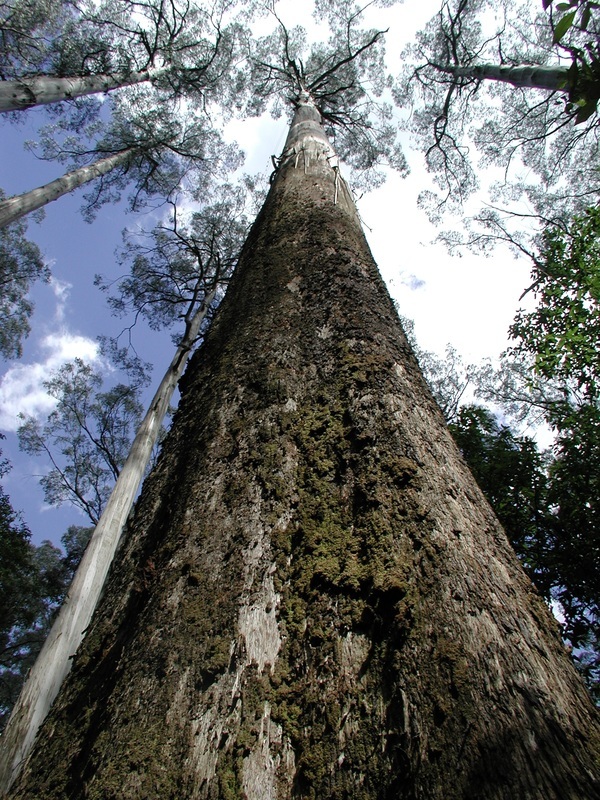 This tree reached 92.4m tall in 2009 before being killed by the Black Saturday bushfires. Wallaby Creek 'Big Ash Stand' before the fires: 80m+ tall trees rise above a thick understorey of tree ferns, musk daisy, hazel pommaderris and ground ferns. Five months after the fires, the first signs of life at Wallaby Creek are the resprouting tree ferns which seem to be able to survive quite severe bushfires. However, every tree in this photo is dead and the formerly thick understorey is now ash. The tallest living trees remaining in Victoria today are a combination of older trees in the 150-300 year old class and those that began their lives following fires in the 1920s and 1930s. For regrowth trees to among the tallest trees in the state means that they are growing in ideal conditions - usually at a relatively low altitude, in or near a protected gully and near a permanent stream - and all of the known tallest regrowth trees are still growing vigorously. The tallest of these trees is 92.1m with another 3 trees known over 88m. As long as these trees can escape fire and windstorms, it is expected that Victoria may again have a 100m tall tree in 30-40 years. 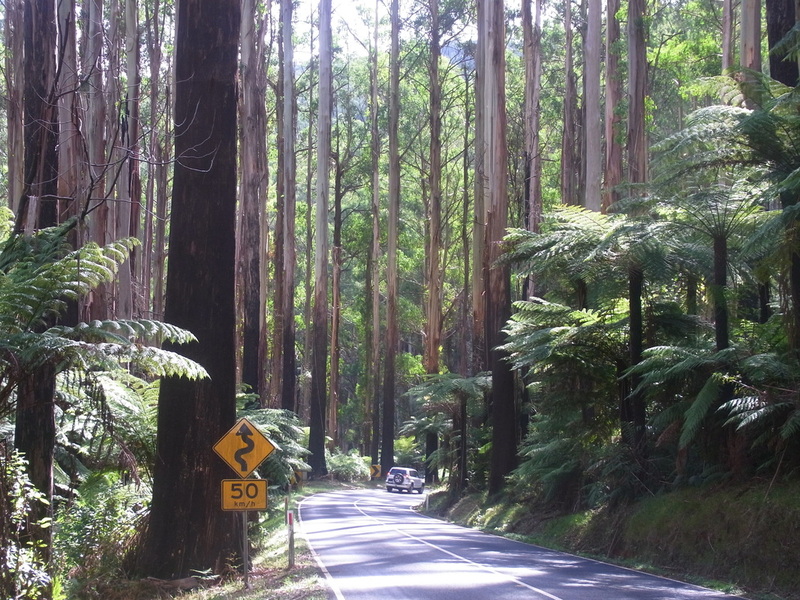 The drive between Healeville and Narbethong, 90 minutes east of Melbourne, takes you through the Black Spur featuring some fantastic stands of 1939 regrowth Mountain ash forest. Many trees exceed 75m in height with some exceptional individual trees exceeding 85m. 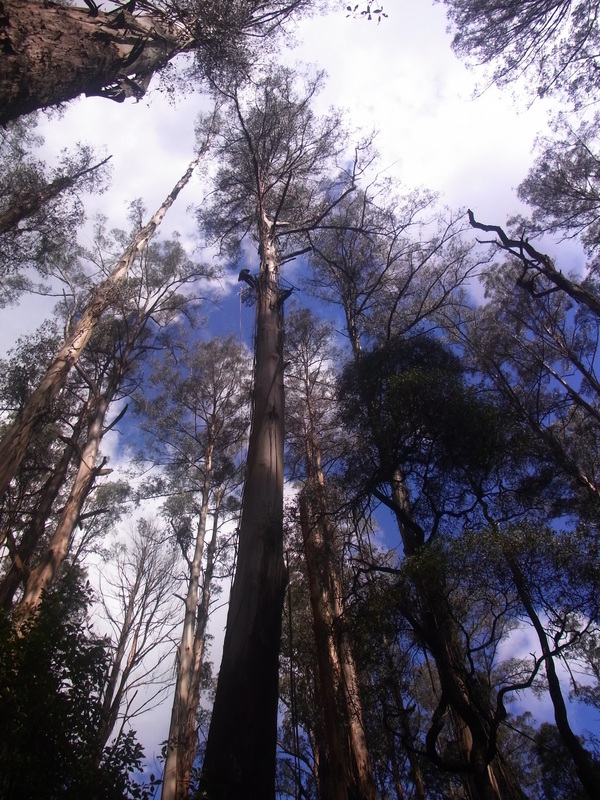 There are at least 25 trees that exceed 80m in height along Sassafras creek in the Dandenong Ranges. The tallest of these have been climbed to get a very accurate height estimate. These trees originated from fires in the 1920s and are around 85-90 years old and adding about a meter of height every four or five years. In an extrordinary patch of tall forest near Beenak, 10 trees exceed 80m in height - the tallest of them being 88m - in an area less than a quarter acre in size. These trees originated in the 1926 bushfires and there is an old, overgrown track that actually runs through the site that predates the trees.